Now that SATS are over for our Year Sixes we can start to prepare for our summer production - Shakespeare Rocks! It is based on the diaries of William Shakespeare and is a great introduction to the famous bard. Our topic this term is the 'Maya Civilization' from Central America. It's a fascinating journey through rainforests and lost tribes via chocolate and pyramids. We will be studying life cycles in both plants and animals and think about ourselves as our bodies start to change. The highlight of the term - the residential! A fun packed week of activities on the south coast. Please let the sun shine! This term our topic is 'Inventors and Inventions'. We will be studying inventions that changed the world. What do you think has been the most important invention ever? Our science work will focus on electricity and light. 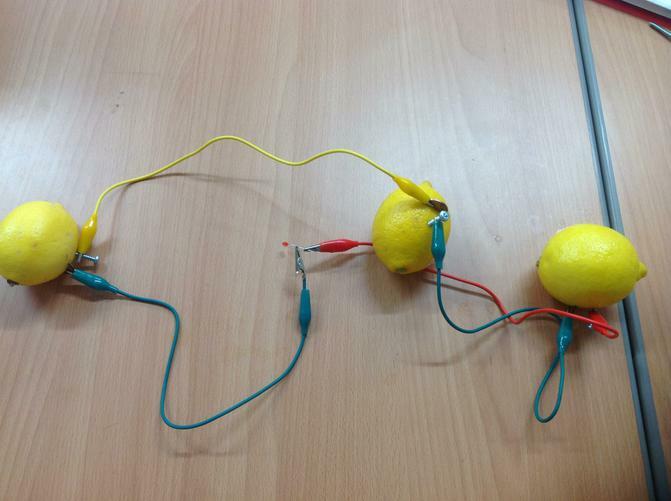 This week we have invented batteries made from lemons to power LEDs. We will also be studying the work of Leonardo da Vinci as an example of an artist and inventor. So far we have measured our bodies and found that we are 'perfect' humans! We had fun creating Vitruvian Man parodies. Class 4 visited Colchester Castle in order to find out more about Roman life in Colchester. The day started with a trip into the vaults which were actually the foundations of a grand temple on the site. The temple was the scene of a devastating massacre of the Roman citizens by local armies. We listened to stories of great battles and even acted them out. Later on we followed a trail round the museum and discovered Roman artefacts left buried in the town. We were especially impressed with the recently discovered Fenwick Collection. Finally we compared Celtic Roundhouses and Roman Villas. We were intrigued by the Roman central heating system. We have looked at the design of Roman lamps and made our own versions from clay. We used olive oil to fill them and then experimented with different wicks. Unfortunately they smelt terrible (like fish). We also tried to build our own Roman arches, some were more successful than others! Miss Debbie Millar visited our class for a special hip hop/street dance lesson. Everyone joined in and had fun trying to remember the moves. Timber! In our computing lessons we have been looking at tessellations with a focus on the work of M.C.Escher. We then looked at Roman mosaic patterns and used the computer to design our own mosaics. We then used ceramic tesserae to create very authentic looking mosaics on wooden tiles. Thank you to Mr. Hope for supplying and cutting the wood. The finished designs are amazing. We have been fortunate to have had specialized squash instructors for PE this term. Last week to end the sessions we visited The garrison for a game on a real squash court. The afternoon was thoroughly enjoyable. I was very impressed by the improvement of all the players. Romans This link has lots of interesting information about the Romans. As part of our computing curriculum, children are taught to use our school blog. They have the opportunity to have their work published on line and blogging provides a worldwide audience for pupil’s work. It is a fantastic opportunity for the children to get excited about writing. There is a space after each post to leave a comment. You will need to provide your own email address in order to do this (email address is not published). The children would love to have some positive feedback from a real audience. Please click on the link below to view our school blog.